Wilmington-born Anna Mathilda McNeill Whistler was the mother of artist James Abbott McNeill Whistler and the subject of his most famous painting. Although officially titled Arrangement in Black and Grey No. 1: The Artist's Mother, the painting is popularly known as Whistler's Mother. Anna Whistler was born in 1804 in a two-story brick house on the corner of Fourth and Orange Streets in Wilmington. Her father had settled in North Carolina in 1785. Anna married George Washington Whistler, and their first child, James, was born in 1834 in Lowell, Mass. When James was nine years old, the Whistler family moved to Russia, where Maj. Whistler worked as construction engineer for the St. Petersburg-to-Moscow railroad. A cholera epidemic in St. Petersburg forced Anna to take her children to England in 1848, where James studied art. When Maj. Whistler died from cholera that year, Anna returned the family to the United States. After attending West Point, James returned to Europe in 1855 to resume his study of art. Anna joined her son in London in 1863. James Whistler painted the famous portrait of his mother in his London home in 1871. After completion, the painting was exhibited in a number of art galleries throughout London but did not receive immediate acclaim. Anna died in 1881, and a few months later, the portrait went to America, where it was shown in Pennsylvania and New York. Although denied a permanent place in the Royal Academy in London, the painting gradually drew praise and admiration. Shipped to Paris for sale in 1891, it was purchased by the French government for 4,000 francs. As a prelude to its acceptance into the collection of the Louvre, French authorities exhibited Whistler's Mother in the Luxembourg, where the painting was favorably compared to the works of Rembrandt, Titian, and Velázquez. In 1927, 24 years after the death of the artist, the portrait of his North Carolina-born mother earned James Whistler his place among the masters at the Louvre, a first for an American-born artist. In 1932 the painting returned to the United States for a coast-to-coast exhibition. During the American tour, the U.S. 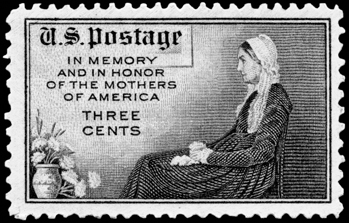 Postal Service issued a 1934 Mother's Day stamp of Anna Whistler. State highway historical markers designate the site of her birthplace in Wilmington as well as the site of Oak Forest, her family's plantation in Bladen County. Kate R. McDiarmid, Whistler's Mother: Her Life, Letters and Journal (1936). Elizabeth Mumford, Whistler's Mother (1936). Whistler's Mother NC Historical Marker D-9: http://www.ncmarkers.com/Markers.aspx?MarkerId=D-9 (accessed February 23, 2015). Thank you for this helpful information. We will add a note below the article clarifying this.